In the holiest shrine on the island of Kerkyra (Corfu), just off the western coast of Greece, rest the Holy Relics of St Spyridon, which after sixteen centuries, are still in such a remarkable state of preservation that every year he is carried in solemn triumph through the streets on the occasion of his feast day. St Spyridon's place in the holy company of saints would be assured and his prominence established even if the whereabouts of his holy remains were unknown. St Spyridon was thrust into prominence by the climatic events just prior to and including the historic Synod of Nicaea of 325 AD, after a somewhat prosaic and less-than-spectacular service to the Lord in the obscurity which he seemed to prefer. Born on the island of Cyprus, he preferred the tranquility of the countryside he roamed as a boy while shepherding his father's flocks, and even after he rose to the office of bishop he would find the time to tend the sheep on a hillside, where he knew complete contentment. 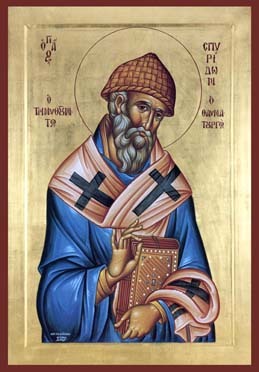 St. Spyridon's beginning were inauspicious enough, coming from a rural family which for generations had lived in such remoteness that there was no school for miles around and what little education there was to be had was imparted by parents whose knowledge was severely limited by their illiteracy. Although he was exceptionally bright, Spyridon was no exception to the rule that doomed most youngsters who were never taught to read or write. The communities that lacked a school never lacked accessibility to a countryside church, and as a boy Spyridon's church attendance was regular. He displayed considerable fervor and remarkable intelligence, which enabled him to memorize long passages from the Bible simply by listening. Although he was needed at home, Spyridon was not denied the formal education he deserved. His parents, not wanting to see his great talent and love for Christ restricted, sought counsel from their priest, who in turn arranged for the boy's education and religious training. Ordained a priest just after the turn of the fourth century, Spyridon was assigned to a rural community much like the one in which he had been reared and made it his first act to use the church as a school for the education of children whose parents he convinced that their offspring could be made more useful citizens if they were given time enough from their chores to learn at least the rudiments of education, particularly how to read and write. His dedication to the people and his complete commitment to the Savior did not go unnoticed, and he was appointed bishop of his province, a post in which he won the admiration of his flock and prominence in the international Christian community. Whenever he could get away from the responsibilities of his office, he chose to rest and refresh himself by returning to the hillside and to the sheep on his family farm. It was in 325 AD that the momentous Synod of Nicaea (First Ecumenical Council) was convened at the request of the Emperor Constantine to resolve the issues so divisive in that era, a conclave to which the greatest figures of Christianity were invited. Among them was the shepherd-bishop Spyridon, whose reputation preceded him and who was therefore made one of the directors. At this meeting Spyridon met St. Nicholas, with whom he formed a lasting friendship, one destined to form a parallel of their lives which comes down to us as a glorious part of the rich heritage of Christianity. St Spyridon acquitted himself most honorably at his meeting and was instrumental in settling a heated debate on the Mystery of the Holy Trinity, which allowed for a successful conclusion to the most important council in early Church history. Like his friend St Nicholas, St Spyridon fell victim to pagan persecution and was one day hauled off to prison, where he was so brutally beaten by the guards that he lost the sight of one eye. Years of misery were to follow then, for rather than execute him the Romans consigned him to the mines. There the gentle bishop lived in squalor and labored in agony for many years before at last he died. Faithful to the end, his last words were in praise of the Lord. His body was cast into a ditch from which it was taken by friends for Christian burial. Later removed, his body lies intact to this day, preserved by the hand of God. Fr George Poulos, Orthodox Press.